After almost forty years of largely fruitless protest, Amungme and Kamoro indigenous owners of the Freeport concession area in West Papua can be forgiven their cynicism at the latest push for accountability from the US-based mining company, Freeport. Despite protests from NGOs, the Asian Development Bank has approved a loan for BP's giant Tangguh gas project in West Papua. 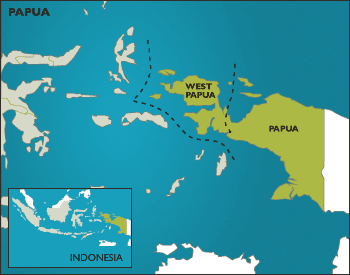 In December 2005, the Asian Development Bank (ADB) decided to put US$350 million towards the $5.5 billion gas extraction and liquefied gas processing plant, now being developed by Anglo-US multinational BP, in Bintuni Bay, in the western part of West Papua. On his recent visit to the UK and Ireland, Rev. Socratez Sofyan Yoman, the President of the Alliance of Baptist Churches of West Papua, reiterated the call for peace talks to be held in West Papua. He pointed to the peace talks between GAM (Free Aceh Movement) and the government of Indonesia, which had struck an agreement including troop withdrawal and an arms amnesty for GAM, and said this should become a precedent.